I’ve been working on larger pieces during the past few weeks. Dressers, buffets, and tables have been making their way up the stairs of my workshop and out the door. My back is a bit sore and I needed to take a break from the big pieces and enjoy a smaller project, so this footstool was the perfect size! It was given to me by one of my fellow merchants at Morgantown Market. What can I say? I work with a pretty awesome group of vendors! 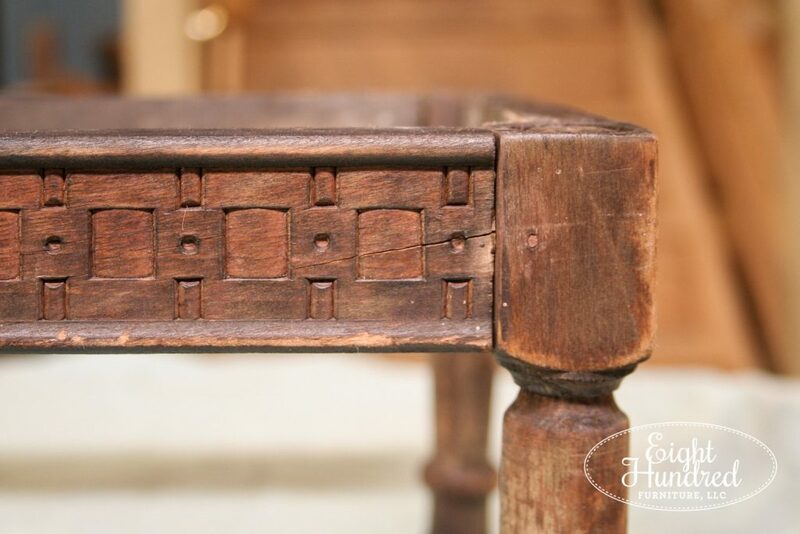 My favorite part about it was the beautiful detail on the wood base. The fabric was pretty but it didn’t quite match the primitive style of the bottom. It was a little too busy, so I took a stroll through the booth spaces of the Market to see if anyone had some antique linen I could use. I found a beautiful homespun towel upstairs in the booth of Kathy, the French lady. (That’s how I’ve come to refer to her!) She takes trips to France every now and then and brings back antique treasures to sell in her space. 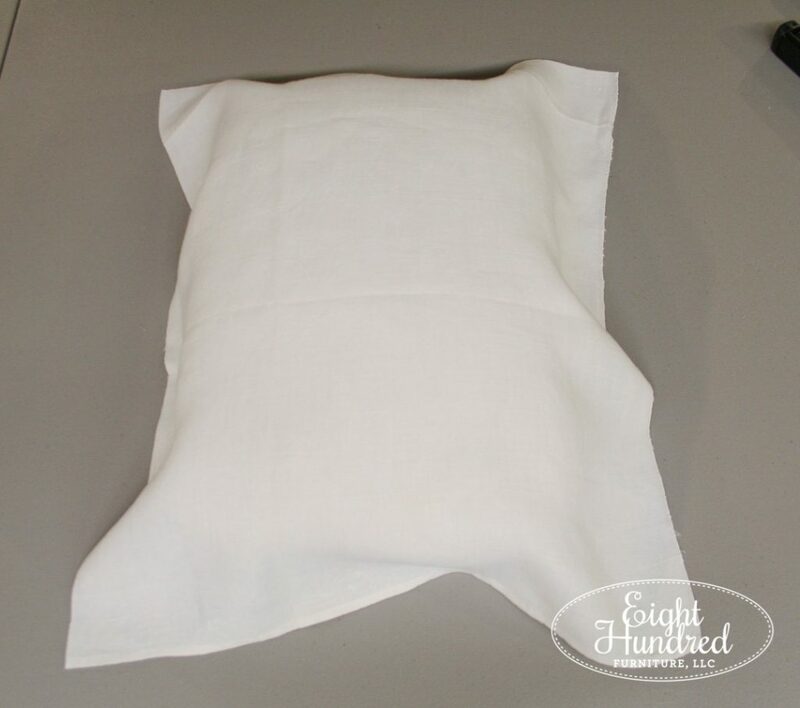 I love seeing what she has curated from her travels, including her antique linens. Once I got everything home, I separated the base and the top. 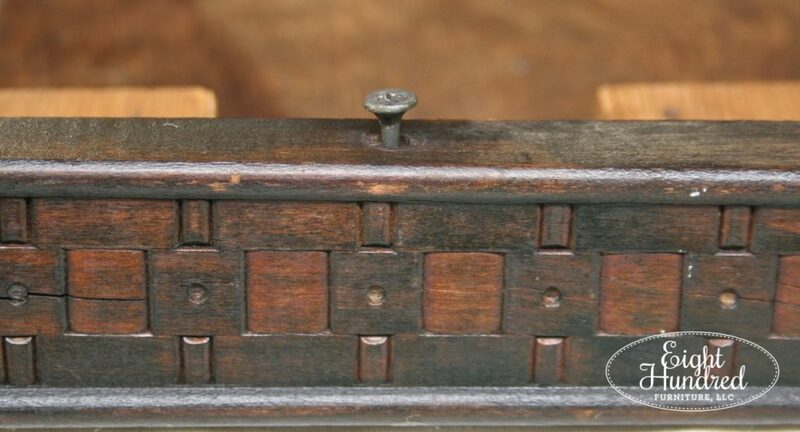 They weren’t screwed together, and sometime in the past, a previous owner had fit blocks of wood in each corner for stability. Putting the base aside, I set to work taking off the fabric from the top. There were two layers, so I tackled them one at a time. I used my Osborne Tack Remover, but if you don’t have one of those, you could always use a flathead screwdriver. But as you can see, a flathead screwdriver works just as well. I wiggled my tool under the staple and lifted it up as far as it would go. Then, I used a pair of needle-nose pliers to pull it the rest of the way. The staples on this piece were easy to remove so the first layer took me no time at all. 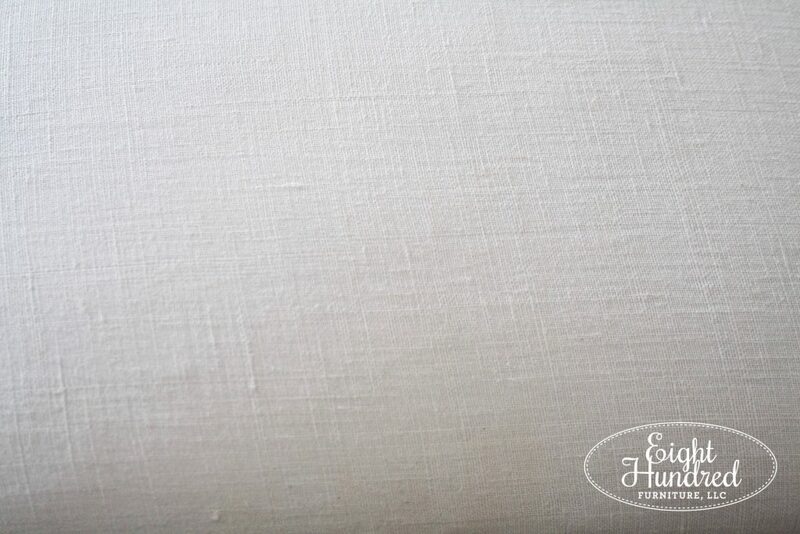 I expected the second layer to be muslin, but it was some other type of fabric. 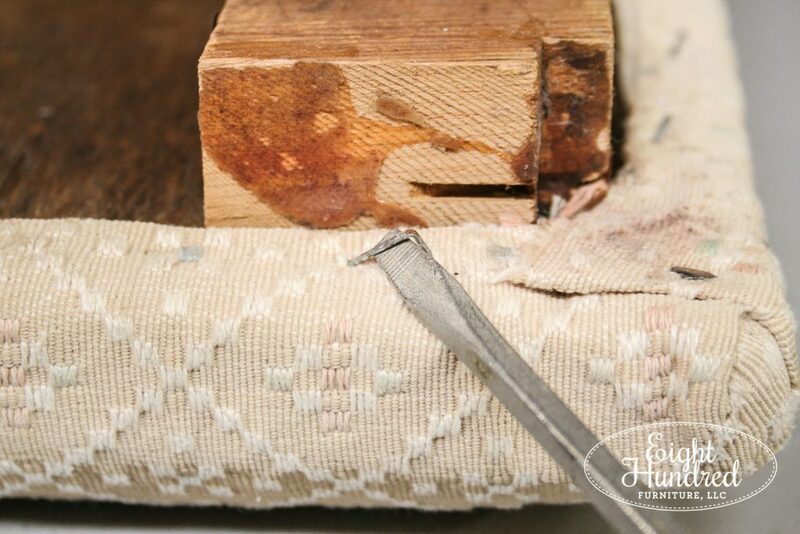 Typically, you find muslin underneath decorative fabric on older pieces, but not this one. Regardless, it was removed and discarded along with the smelly and stained foam underneath. 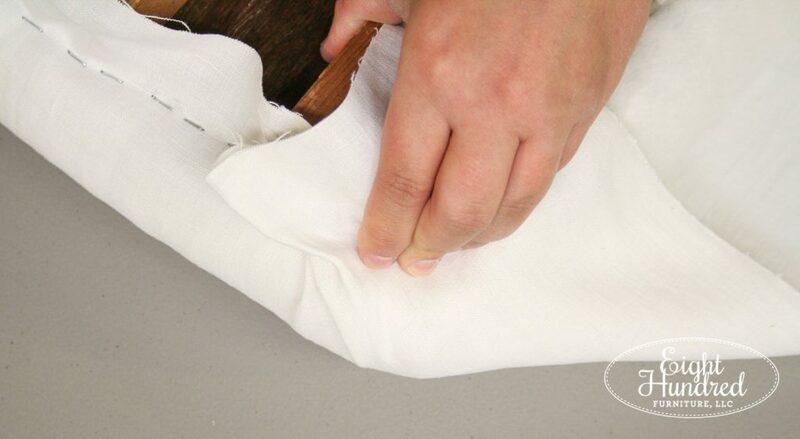 When you’re removing fabric from an upholstered piece, investigate the layers underneath. 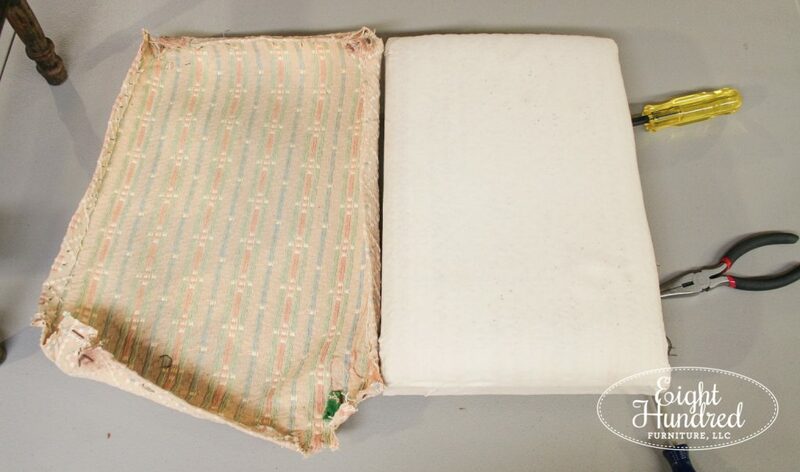 Sometimes the padding is reusable, but make sure you do a sniff test. If it smells musty or moldy, don’t be cheap – throw it away. 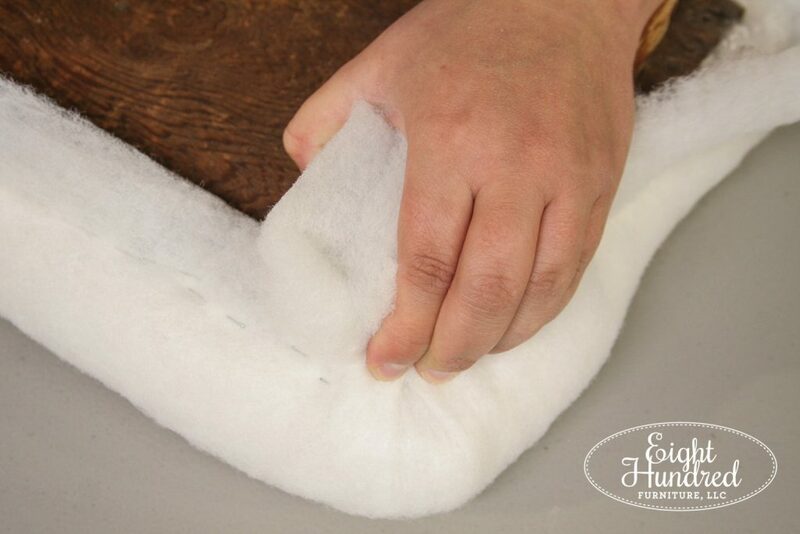 Spend the money to place fresh padding on your piece and upholstery in a sanitary manner. 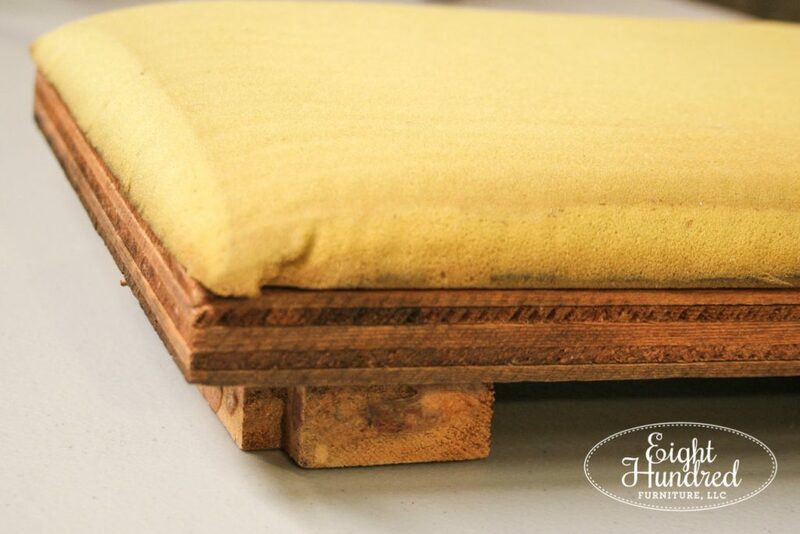 Now that my footstool was completely torn down, it was time to rebuild it from the bottom up. 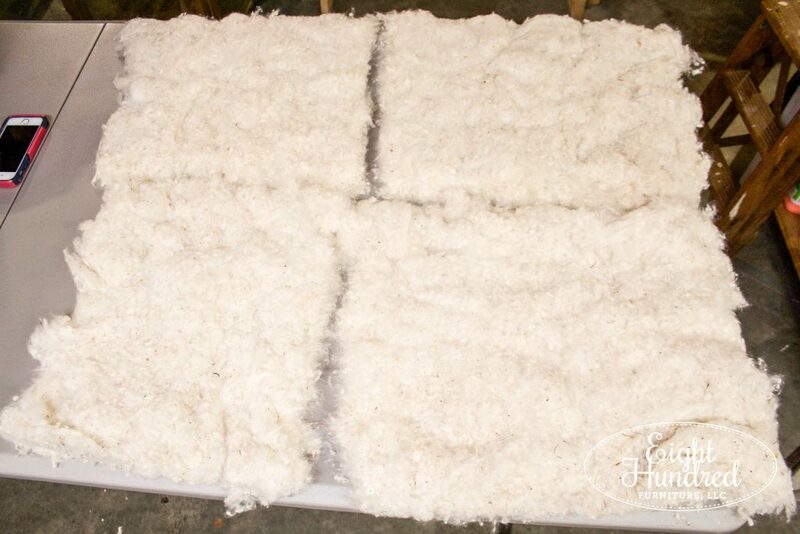 Whenever you do an upholstery project, pay attention to the layers you remove. When you’re ready to put everything back together, repeat the layers in the opposite order you removed them. 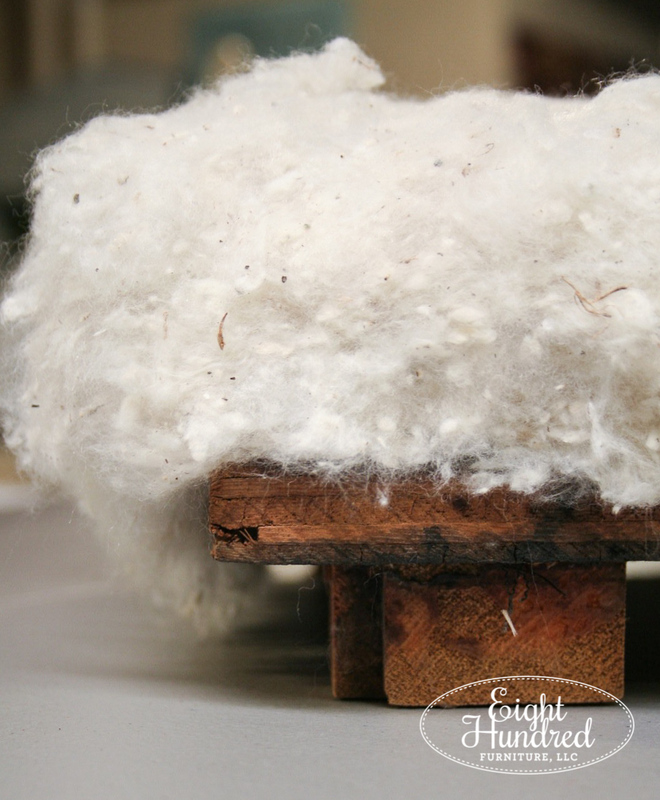 I started layering the cotton onto the wooden top and removed any overhang with my hands, tearing as I went. 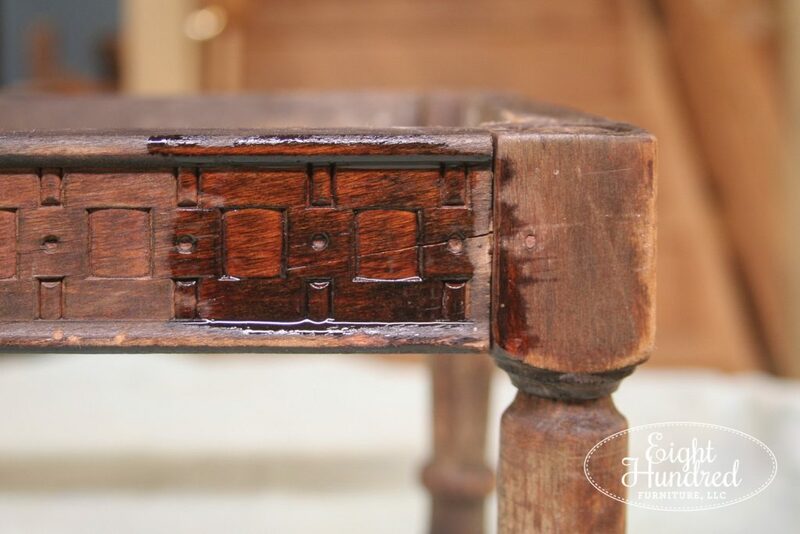 As I layered one piece over the other, I was feeling each time to see if I could still detect the wood underneath. I went until I pressed down and could only feel padding with my hands. This piece needed three squares of cotton total, so I saved my extra piece for another day. Here they are layered on top of one another. As you can see, I have a bit of overhang, but not much. 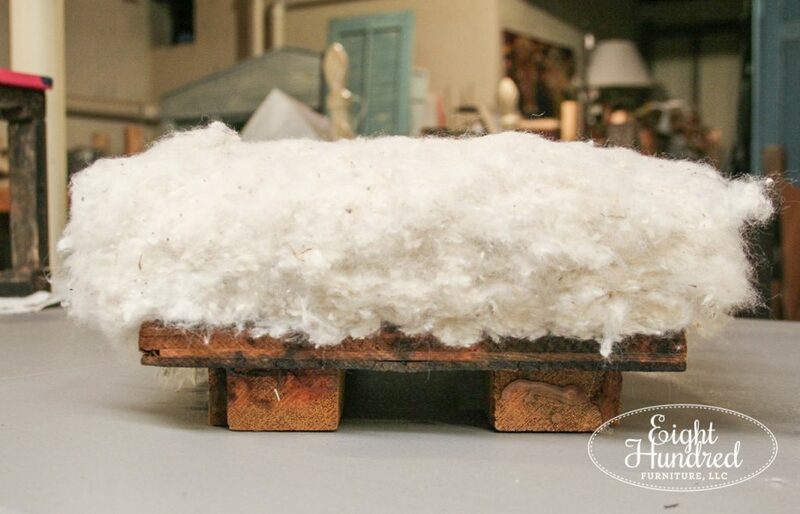 At this stage, the footstool looked more like a shabby sheep! 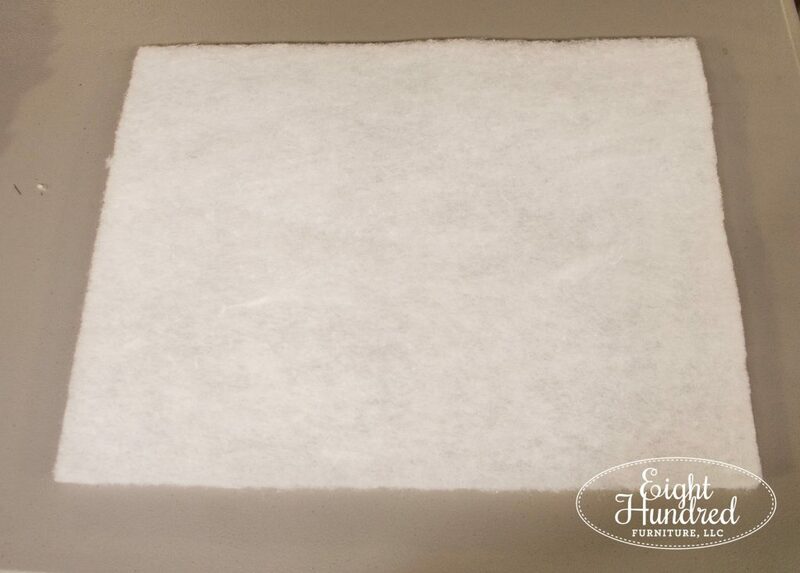 This is dacron – a polyester padding that comes in large rolls and varying thicknesses. 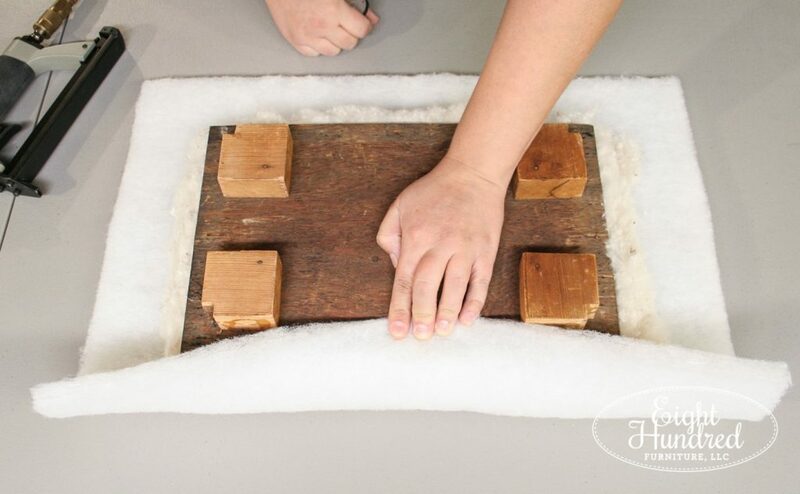 Dacron’s job is to be the final layer of padding that smooths everything underneath. 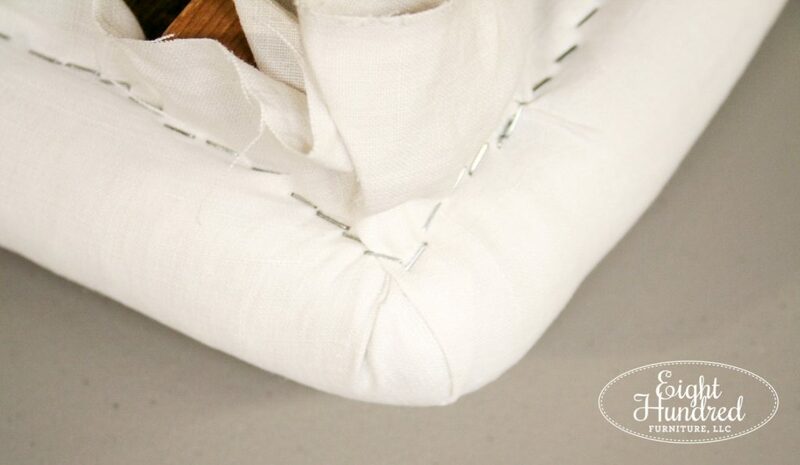 I flipped the footstool upside down and began slowly stapling the dacron on, starting with the sides. 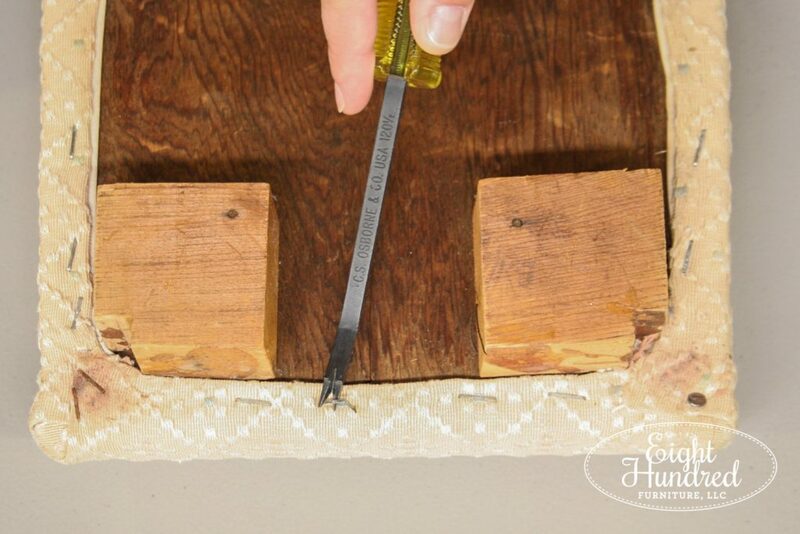 A pneumatic stapler is best whenever you’re doing upholstery work, however for light jobs like this, you may be able to get away with using a hand stapler. I used one for years, but it limited me to small projects and I broke a LOT of staples. I finally invested in a good gun and borrowed my father-in-law’s air compressor and it’s made such a big difference in the quality of my work. It’s like trying to paddle a canoe with wooden spoon versus a paddle. They both work, but one takes a whole lot more energy and is less efficient. Once I got to the point where all of the sides were stapled, I folded the corners down as neatly as I could. I made sure to pull tight and stapled everything in place. The corners are where you’re probably going to need the power and “oomph” of a pneumatic staple gun to be able to shoot through thick layers of dacron. Using my scissors, I trimmed off the excess, making sure to get as close to the staples as I could. 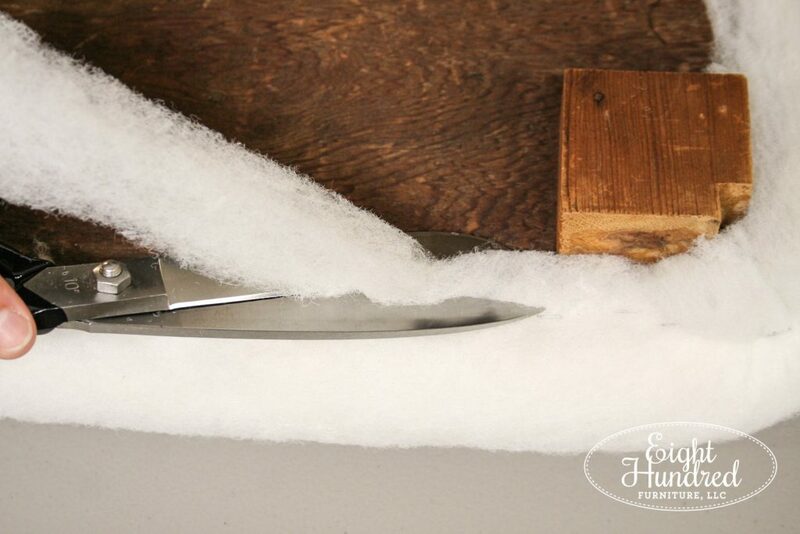 To prepare my homespun, I pressed it with a clothing iron to ensure there wouldn’t be any creases on my final piece. Using my fabric tape measure, I got the size of the piece of homespun I would need and cut it to size. As you can see, some of the creases didn’t press out all the way, but they would eventually disappear once I started pulling and stapling it down. 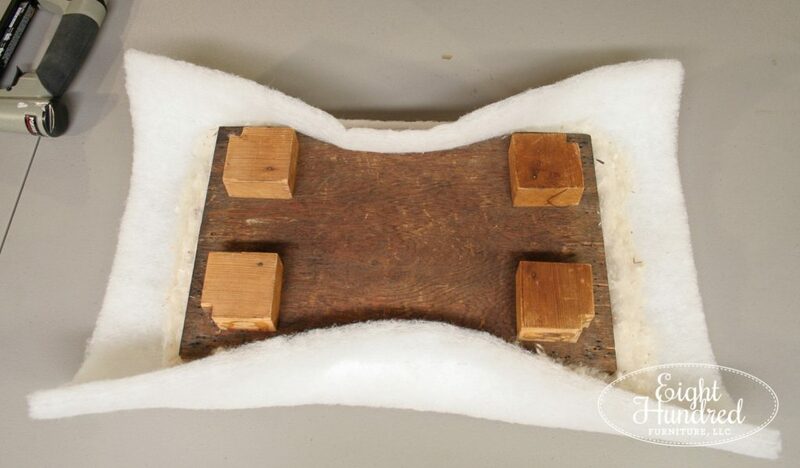 I worked my way around the base in the same manner as the dacron – starting with the sides and leaving the corners last. I was a bit more careful with them and it took some work to get the fabric to fold nicely. Here’s the mitered corner I created. The next step was to trim away all of the excess fabric. It’s a good idea to leave yourself about 2 inches all the way around so you have something to pull on as you’re stapling. 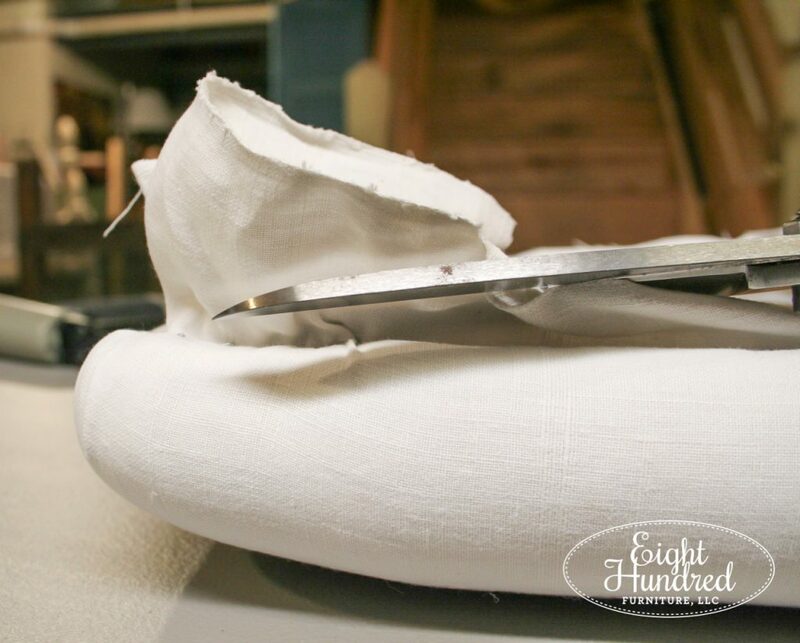 I know it’s a little difficult to trim away so much extra fabric and throw it away, but it’s better to do that than try to finagle a piece of fabric that’s been cut too small. That wrapped things up for the top, so I turned my attention to the base. The wood was absolutely gorgeous so I decided not to paint it. Despite its beauty, it was very dry, so I hydrated it by brushing on some of Miss Mustard Seed’s Hemp Oil Wood Finish. The transformation was immediate! That, dear friends, is the beauty of Hemp Oil. 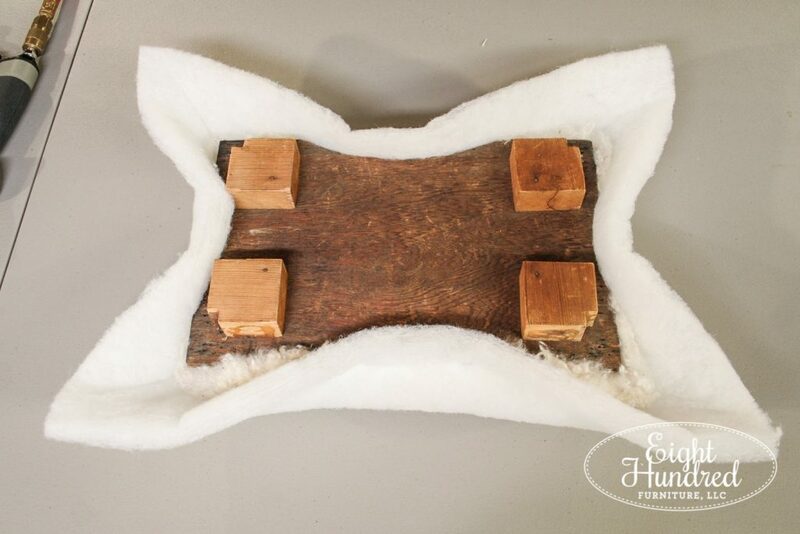 It instantly revitalizes dry wood and restores its natural luster and richness. 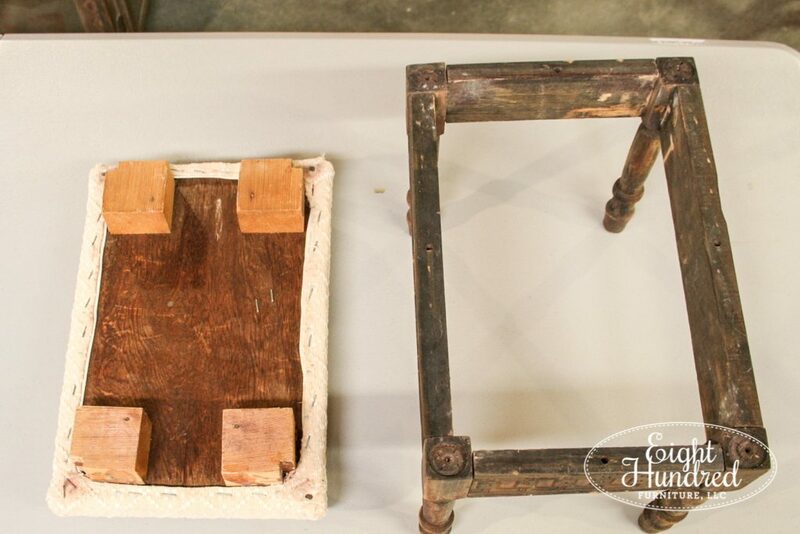 After brushing Hemp Oil over the entire base, I didn’t need to wipe off any excess – the wood was THAT dry! To attach the base and the top, I found 3 inch long drywall screws. They wouldn’t bite in the original holes, so I countersunk them to give the screws a bit more distance to poke through the bottom of the base. 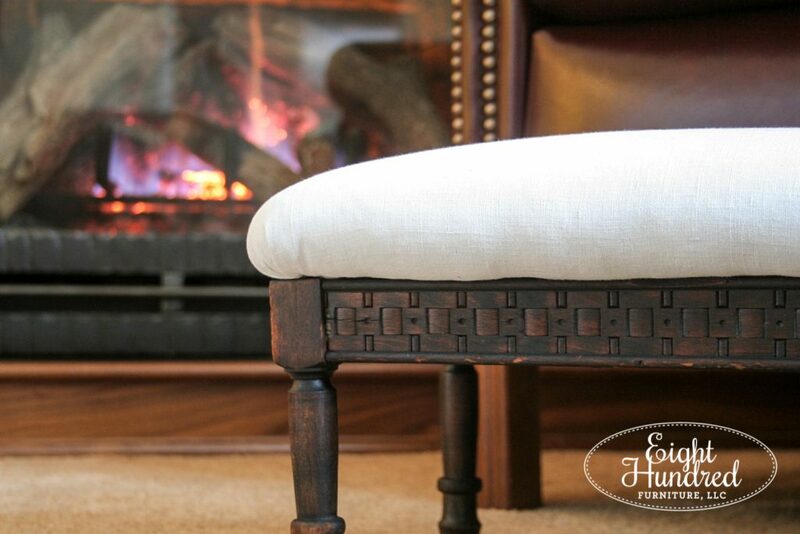 Once the holes were countersunk, the screws bit into the top just fine and I took my little antique stool over to the fireplace for a photo shoot. 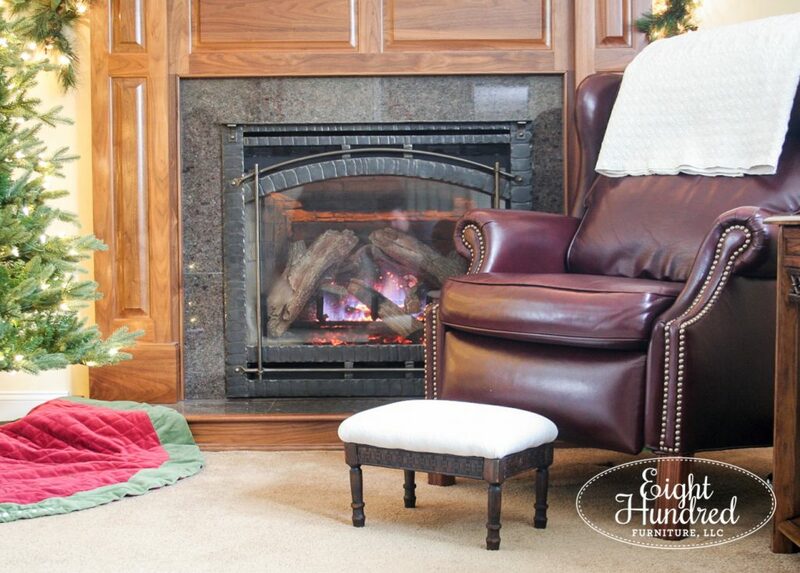 Doesn’t it look so happy sitting by the fire? I half expect it to start barking and running around the house like the one from Beauty and the Beast! 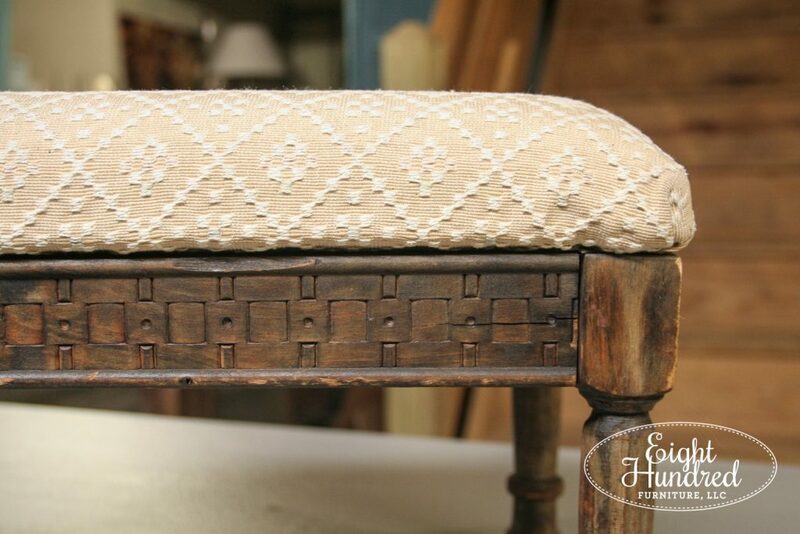 The homespun is a more appropriate fabric to adorn the top and it matches the style of the base. 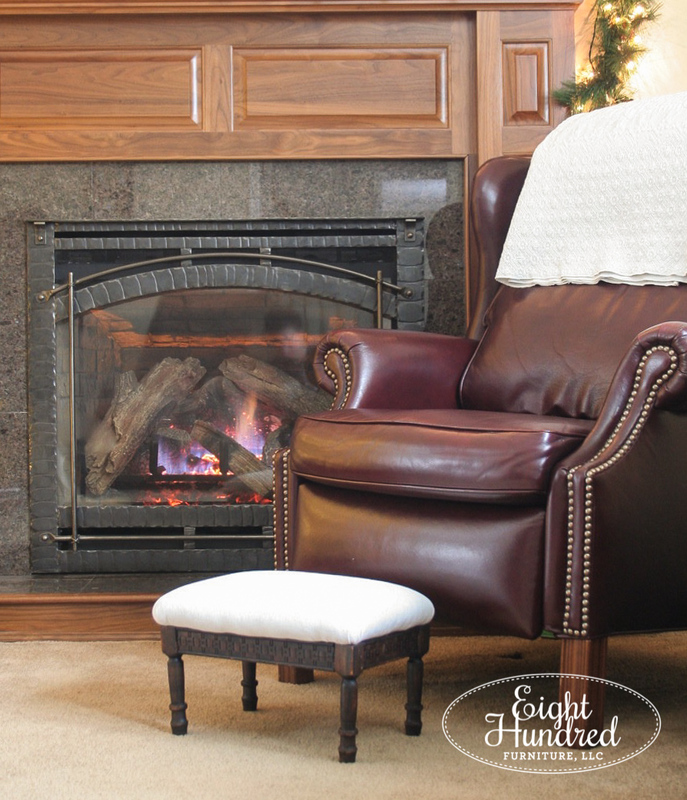 Who wouldn’t want to prop their feet up on it after a long day’s work and relax by the fire? 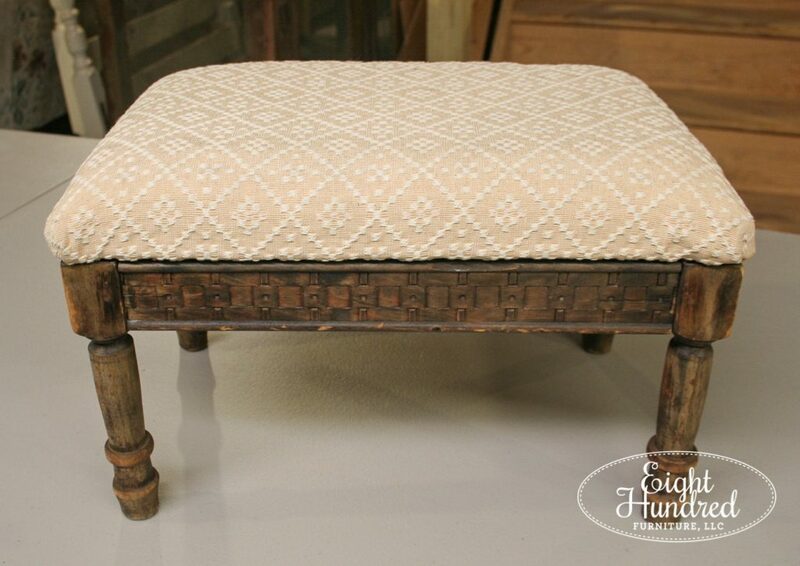 This footstool will be coming with me on my next trip to Morgantown Market and will be available to purchase for $48. 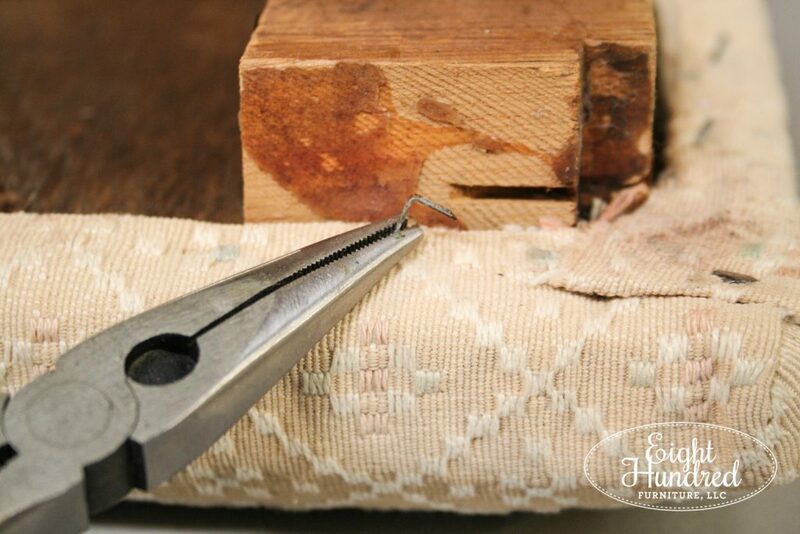 If you’ve been inspired to tackle a small upholstery project like this, you should pick up some Hemp Oil and antique linens from Morgantown Market. I’ve got the Hemp Oil and The French Lady, Kathy, has the linens!